This past Christmas, one of the gifts I asked for was the Byzantine crucifix pictured above, which was available at a local Christian book shop. I wanted it because of my interest in Eastern Orthodoxy as well as the aesthetic beauty of it; it now hangs above my desk at home where I can look upon a reminder of the glorious, cosmic event that transformed the world and my own life. Jesus of Nazareth, King of the Jews. Not only is it in Latin, but it is not what Byzantine crucifixes tend to say. They tend to call him the King of Glory, not of the Jews. I know I’ve seen images of this crucifix before I asked for the one at Christmas, but somehow it escaped me that they were one and the. The significance of this crucifix is as follows. Francis of Assisi, when he had recently rejected his father’s wealth and all the rest, was in the old church of San Damiano praying one day. Hanging in the church was the crucifix in question. Praying before this crucifix, Francis was told by Christ to rebuild His church. Thinking the Lord meant San Damiano, Francis did just that. Later he learned that the church to be rebuilt was the one made of living stones, and Francis began his mission of evangelisation in earnest. This crucifix, then, is very famous and holds a special place in the world of Franciscans. As a work of art, it is interesting, as was pointed out at The National Shrine of St. Francis of Assisi. In this article, we are drawn to three elements in this painting of the crucified God. First, we see the crowd of people beside/surrounding Christ, Mary the Virgin and John the Evangelist on one side, Mary the wife of Cleopas, Mary of Magdala, and Longinus the centurion on the other. At the second level, where Christ’s arms are outstretched embracing the world we see four angels and two men surrounding a black chamber — the empty tomb. The men are Sts. Peter and John, the apostolic witnesses of the empty tomb. Third, above our Saviour’s head we see Him ascending into Heaven and greeted by angels. The salvation event is before us here, with the crucified God standing central as a King in control, crucified, resurrected, ascending before our very eyes. 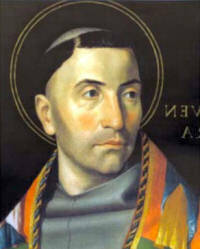 Depicted in line and colour is the salvation of the world, the theology of our own lives. 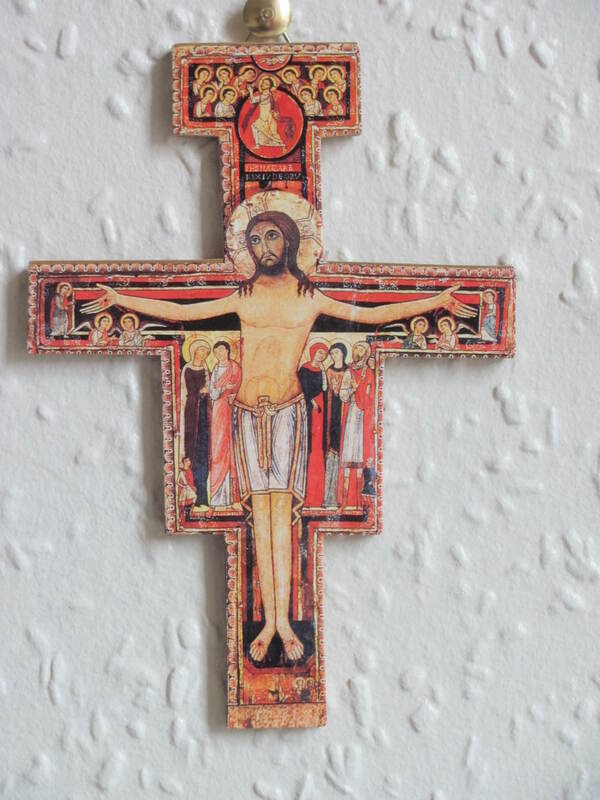 Here we see the centrepiece of our faith on the San Damiano crucifix, the crucifix that the Lord used to draw Francis to transform the world. I first encountered the Laudable Exchange via that modern Franciscan musician and spiritual father, John Michael Talbot on his album Meditations from Solitude . Being a big John Michael Talbot fan, I was excited to read the words in the original context, actually aware of St. Clare’s authorship. This Laudable Exchange is the essence of Simplicity, inward and outward. The things of time: careers, business, worries, fears, hatreds, loathings, lusts, passions. The things of eternity: Christ, the Heavens, peace, calm, bliss, justice, equanimity. The things of time: books, CDs, computers, blogs, extra cloaks, fancy foods. The things of eternity: abundant life, service, glory, the Spirit, the music of the heavens. Let us all make the Laudable Exchange ourselves.